Okay, onto the polish! I received these polishes from Cameo Colours Lacquers because I won a prize from Naked Without Polish. 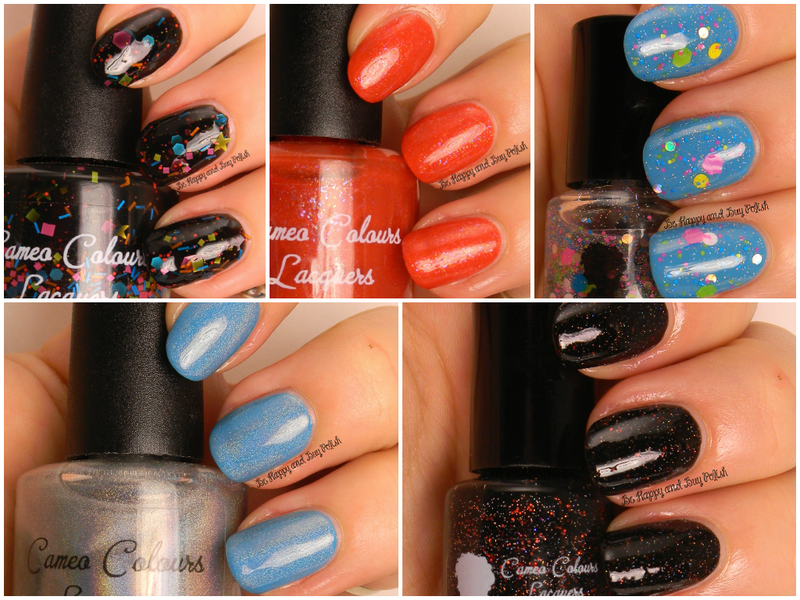 Click through after the collage to see all these beautiful polishes! First up is Hexes & Ohs, a clear based glitter topper with a bit of holo shimmer, and you guessed it, hexes and circle shaped glitters of various sizes and colors. Really lovely glitter topper, I did have trouble getting the bigger glitters out. This is 1 coat + dabbing over Précision Nail Lacquer Surfin in Maliblue (2 coats), with KBShimmer Clearly on Top. Next is Night of the Hunter, a black base polish with holographic & red glitters. This is a really lovely polish, a definite favorite. This is 2 coats, with Clearly on Top. 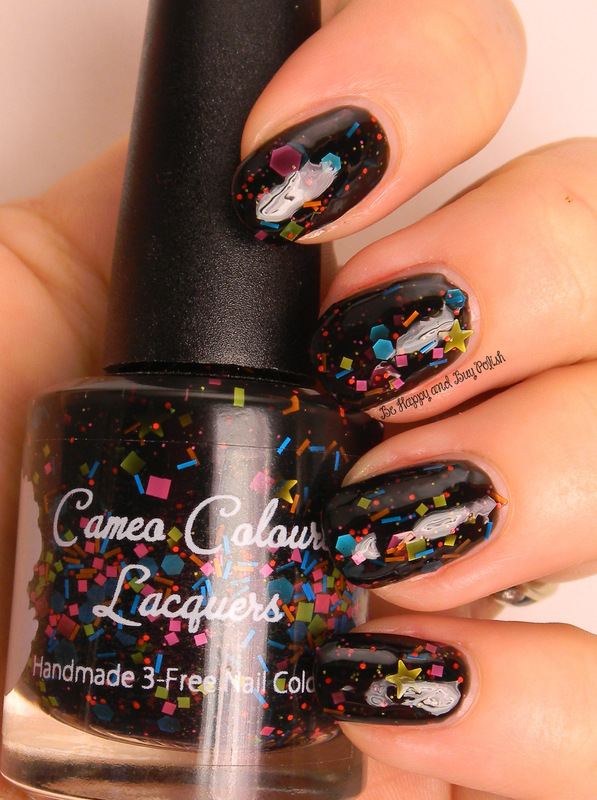 Neon Lit Nights is a jelly black base polish with neon glitters of various shapes and sizes. Unfortunately, this was not one of my favorites, but it’s a personal thing – I just can’t like bar glitter no matter how hard I try. LOL. 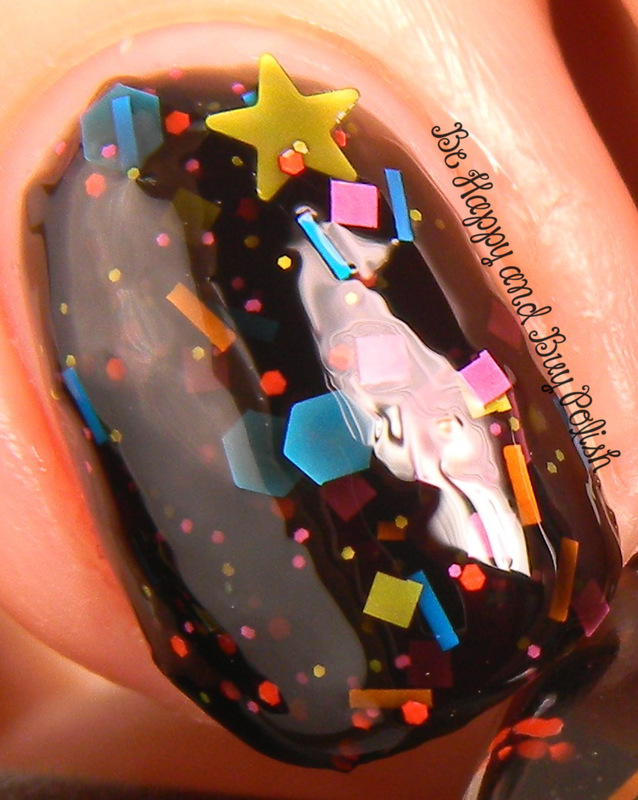 The glitters were hard to get out, I placed the star glitter just so on the nail. This is 3 coats, with Clearly on Top. This is Mazapan, a tomato red base polish with various colored flakies. This is a pretty polish, but it did stain my nails in the time it took to swatch & take photos. Make sure you double up on base coat! This is 2 coats, first with A Girl Obsessed Matte-ict top coat, then with Clearly on Top. Lastly, this is Spectacular, Spectacular, a stunning linear holographic topper. Do I love this? Yes, yes, and dayum, yes! This is 1 coat over Surfin in Maliblue (2 coats). I have two other polishes to show you, Luminous and Becky’s Intriguing Decision. Those two though, are such interesting polishes that they deserve their own posts. You can keep up with Cameo Colours Lacquers at their shop, on Facebook, on instagram, and on twitter. Wow spectacular spectacular is amazing! And I have to admit that this is my first time stopping by your blog since you got your new camera ( I know Im a bad blogging friend) and your pictures are phenominal. Especially those macro’s. Keep up the great work! What awesome swatches of these colors. My favorites out of the bunch are Hexes & Ohs, Mazapan, and Spectacular, Spectacular!. I can see why you’re not too fond of fishing stars and the likes, but Neon Lit Lights is sooo beautiful. I could stare at it for hours. I love Night of the Hunter. I can’t get enough of polishes like this. I love them all but how much do they cost and where can I find them? !